Last night, before sleep, I began thinking about all the changes we have weathered with our small, growing company. When we started Inglenook Tile Design about five years ago, our original business plan was to use my experience in design and product development to manufacture our tiles in Asia. I didn’t expect, however, that the factories wouldn’t understand why we wanted our tiles to look old. It was very difficult to communicate that we wanted a random, rustic look, with no two tiles being exactly the same. Our factory wanted to make products that look exactly the same – it is a sign of consistency and quality for them in a country where “new-looking” is synonymous with “modernity.” However, a uniform, modern look was exactly what we did not want. The search for a factory who could reliably create the antique look we wanted dragged on. Frustrated by the slow progress, we turned to the Veteran’s Industries in Myerstown, PA. It was a sheltered work program for veterans from the Lebanon Veteran’s Hospital. We trained the veterans to make our tiles, and they were supervised by the facility manager, Dave, whose commitment to us and our products grew into a great friendship and boon to our company. In 2005, when the government unexpectedly closed the workshop, we were forced to make other plans and move to our own warehouse space. The husband of one of our former employees from the doll company (our first company) owned a warehouse, so we signed a lease for a corner of it and moved into the echoing, unheated space. Meanwhile, some Chinese friends found us a factory in Asia. We visited, trained the factory, provided them with molds, and began to import. The factory did a beautiful job, but we noticed several problems: first, it was hard to anticipate what to order ten to twelve weeks before the shipment would arrive. Would we need 4×8” tiles or 2×8” tiles? In what proportion would we mix the order? The factory only made a narrow range of products–if customers wanted special color variations, we had to make them ourselves. As a result, we found ourselves making more and more tiles in our chilly warehouse, bundled in overcoats, and standing in front of an anemic heat dish. The other problems arose, most prominently rising Chinese labor costs and high ocean freight costs. We realized that our manufacturing needed to come back to the US. Our relationship with this VA program and with our vets has been a great blessing and allowed our company to grow with the increasing demand for our brick tiles. This week, we were pleased to hire Billy, who has worked with us for 6 months through the VA and just graduated from their program, as our own full-time employee. We continue to expanding our workspace, buy new equipment, and hire more people as several of our past blog entries have chronicled. I am a believer in the world community and global trade. That being said, when you see “buy American” slogans, it may or may not mean anything to you – but it has new meaning for me. As I tallied up who we are helping to support with our American-made tiles, I was amazed. One small business has such a far-reaching impact on other local businesses and individuals! For example, we make a difference to our friend/landlords by leasing space from them. Our business helps support US-based box companies, kiln and clay companies, and warehouse equipment suppliers. Even the local hardware store, where we buy paint for our warehouse floor, feels the impact of our decision to manufacture in Kinzers, PA. Then, there are utility companies, electricians, our employees, our veteran workers from the VA Hospital, and our driver, Heather, who takes them home. There are office supply stores, print shops and trade show promoters. As I thought through the list, the breadth of the others we touch by manufacturing our tiles surprised and inspired me. Until I was thinking alone in a quiet room last night, I never realized how many people are benefiting from this one little company, nestled in a corner of Lancaster County, Pennsylvania. I went to sleep, proud to be paying our bills and sharing our prosperity with our neighbors. Posted in Blog Updates and tagged Brick tile, brick veneer, Made in USA, Thin brick, US manufacturing, veterans on July 31, 2008 by Inglenook Tile Design. Inglenook is the Scottish word for “chimney” and is often used to describe a warm central hearth in the homes of Northern Europe. 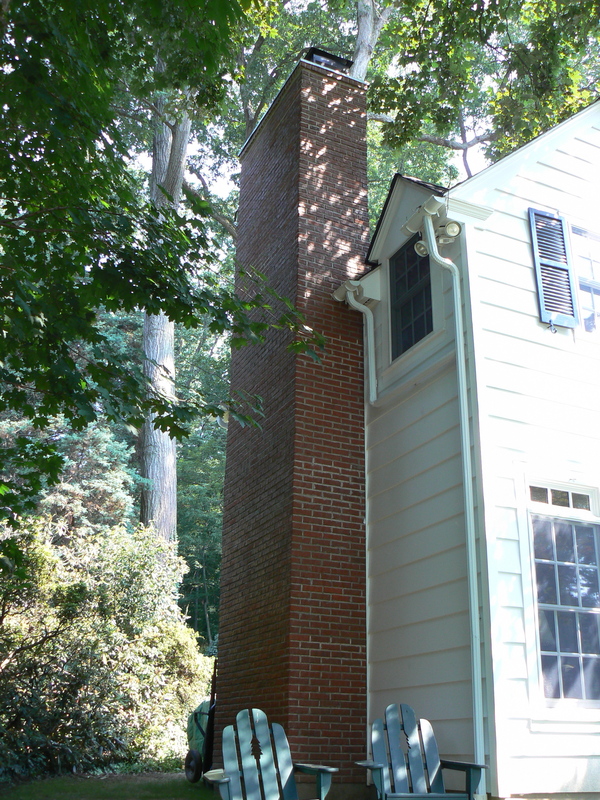 Therefore, it is only fitting that this feature project is a collection of chimneys and hearths, installed in the home of a customer in the Philadelphia area. 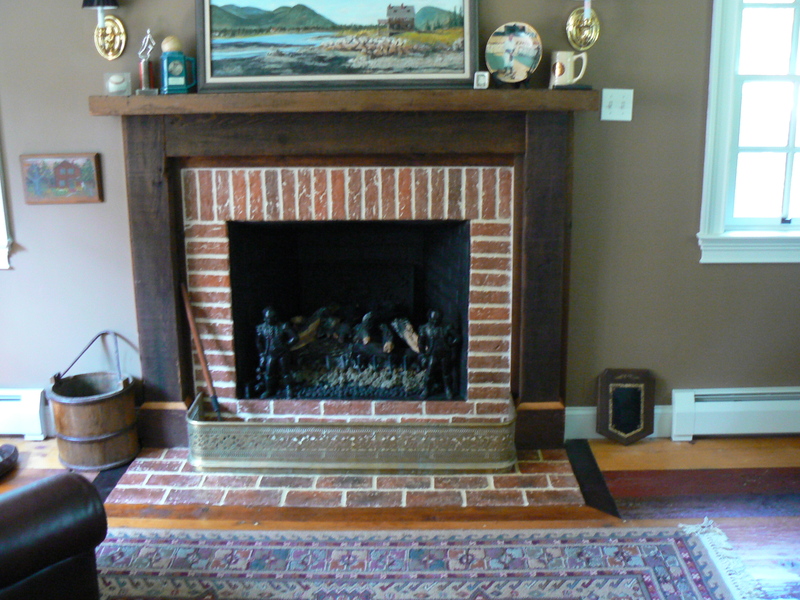 Below are the pictures of David and Margaret’s installations, a chimney, an entryway, and two hearths. (pictured above: their home. directly below: the beautiful hydrangeas in their front yard.) All the tiles shown are in Marietta color mix. Click here to see a video of this installation. It’s a little rough– our first time with our new video camera– but it gives you a feeling for the project. 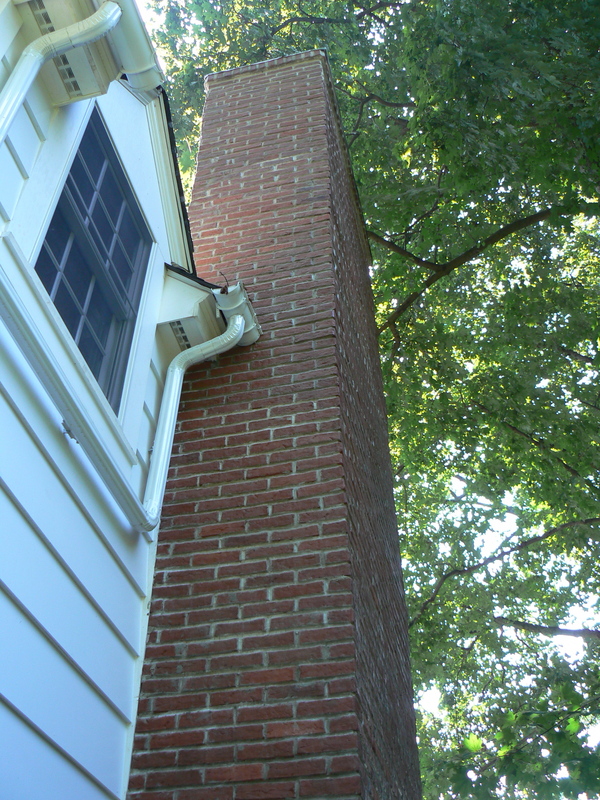 We’ll start outside where David and Margaret used Lancaster Running Bond 2×8″ brick tiles and corner pieces to cover the outside of their chimney. You’d never know that it wasn’t full-sized antique brick! 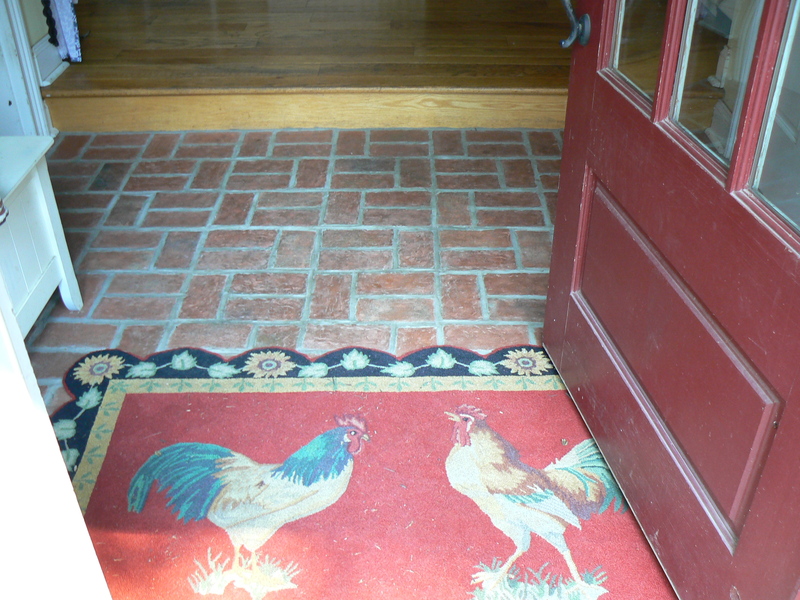 Inside, we see the entryway that was David and Margaret’s first installation with Inglenook Tiles. They used Wright’s Ferry 4×8″ brick tiles in an offset basketweave pattern. David and Margaret installed our brick tiles for two hearths as well. One of these hearths covers a large region around the hearth outlining a beautiful oriental rug. 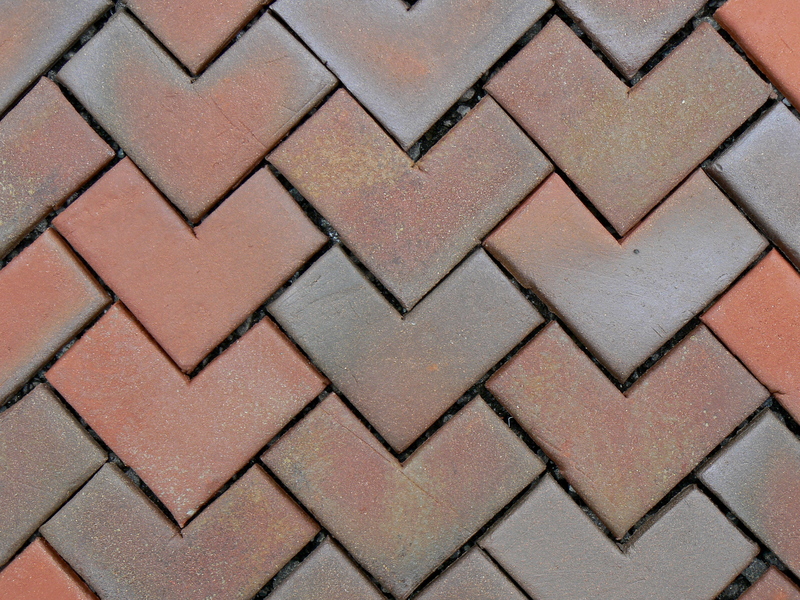 Both hearths used Wright’s Ferry 4×8″ brick tile. First pictured is a closeup of the hearth. 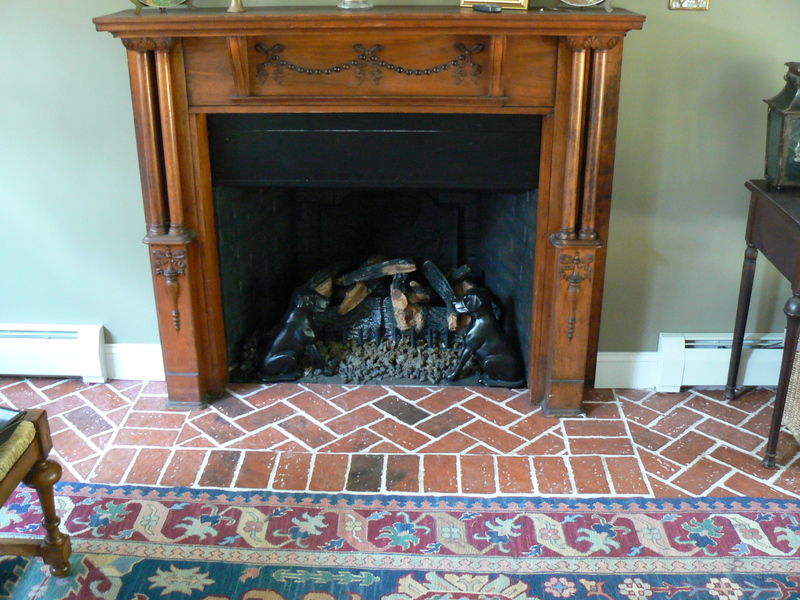 They used a herringbone pattern on the inside of the hearth base with a running bond border. The rest of the floor area is in a herringbone pattern. The second picture shows an image of the entire area. The final picture shows a clear detail of the herringbone pattern along the side of the rug. The second hearth is smaller, using Wright’s Ferry 4×8″ brick tiles in a running bond for the base. The surround uses 2×8″ corner pieces to achieve the appearance of full sized brick. Thank you, David and Margaret, for giving us the time to see your home and the beautiful installations! We really appreciate it! Posted in Installation photos, Lancaster Running Bond 2x8" brick tile, Marietta color mix, Tiles, Wright's Ferry 4x8" brick tile and tagged Brick tile, brick veneer, chimney, entryway tile, hearth, Lancaster Running Bond 2x8" brick tile, Thin brick, Wright's Ferry 4x8" brick tile on July 21, 2008 by Inglenook Tile Design. Provence, a region of southeastern France on the Mediterranean Sea adjacent to Italy, is known for its wine, artists, and rich culture. Our Provence collection is rustic and welcoming, equally at home in a cheerful cottage or in an elegant chateaux. Combining soft earth tones and brighter accents, our Provence style captures the ambiance of Southern Europe, with its heart in the homes of the French and Italian countryside overlooking lush rolling vineyards, the blue waters of the Mediterranean, or the soaring peaks of the French Alps. In the homes of the Mediterranean region, floors were historically made of natural materials—some wood, but mostly brick, stone and clay tile. Our other collections subsume several of these historic floor types—brick and repeating mosaic patterns. Our Provence collection distinguishes itself with additional classic tile shapes –hexagons, rectangles, and squares– and the hand-stenciled motifs of Southern Europe, rubbed soft as though worn by hundreds of years of use. To give you a peek at what we are working on right now, we’ve pictured two Provence collection tiles that came out of the kiln this Monday. 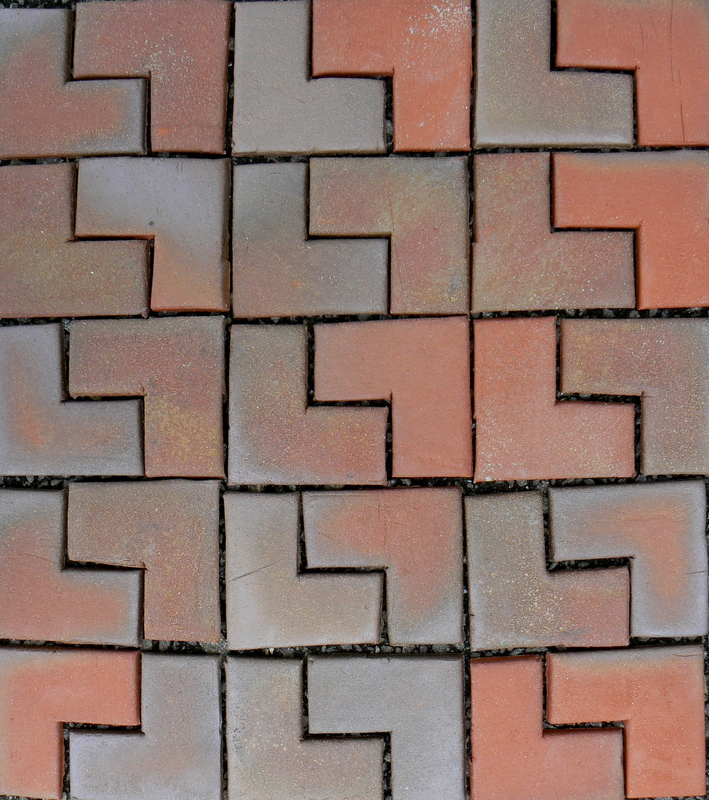 This 6.5” square tile has a deep red clay body accented by corner fleur de lis designs in contrasting beige clay. The fleur de lis motif, a stylized lily or iris, dates far back in history, found in some form in nearly every ancient culture. In more modern history, the fleur de lis has become attached to European, and especially to French designs through its long-standing use on the heraldry of French monarchs. The Corner Fleur de Lis tile will be only one of our Provence tiles to bring this attractive and enduring design to your home. 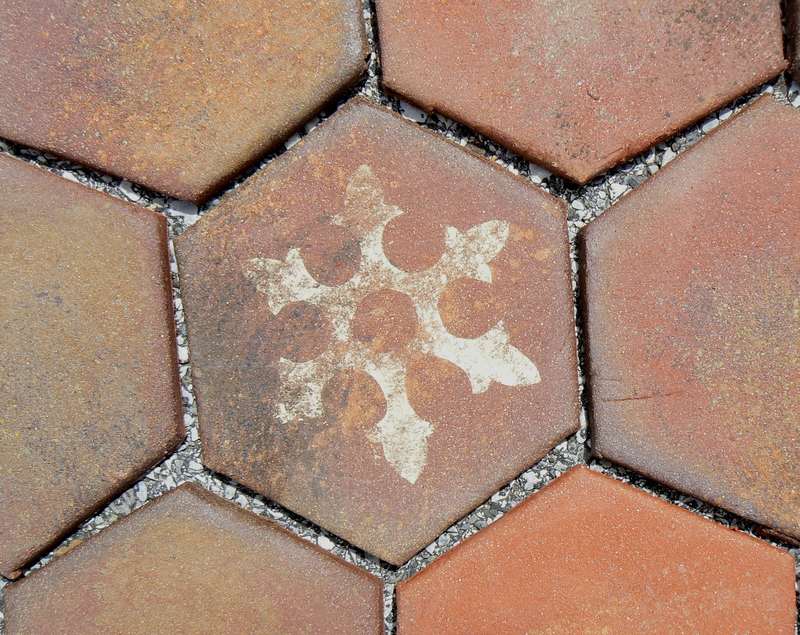 This tile design showcases our classic French hexagons, a tile style often found covering villa floors and rooftop terraces along the Mediterranean coast. Our hexagons will be available unadorned with attractive, natural variation achieved through kiln-flashing, and with stenciled designs, colored with clay slip, powders and oxides. 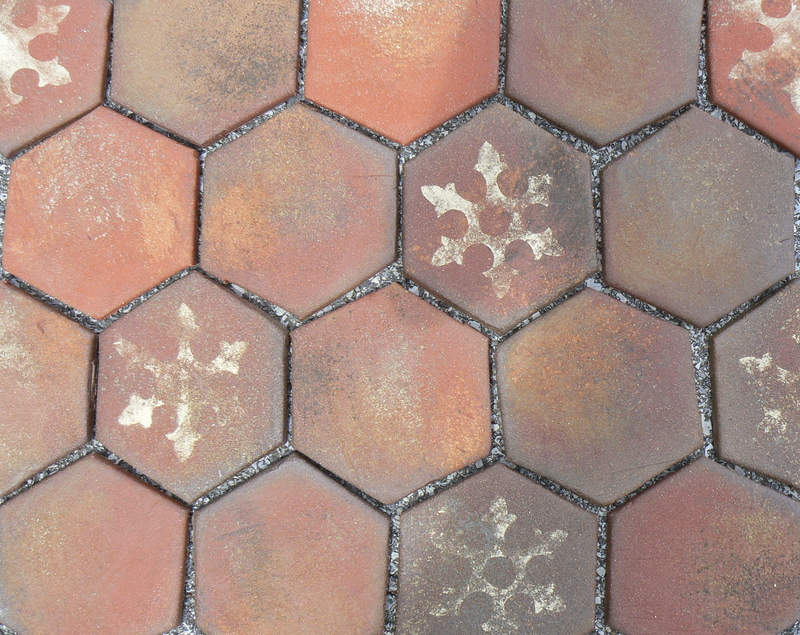 This hexagon design is the latter, decorated with a ‘snowflake’ motif and arranged in a pattern with other kiln-flashed hexagons. The wood ash, oxides, and other natural materials used in the design of these tiles give these handmade tiles a well-worn elegance, as though reclaimed from the floor of a French cottage. 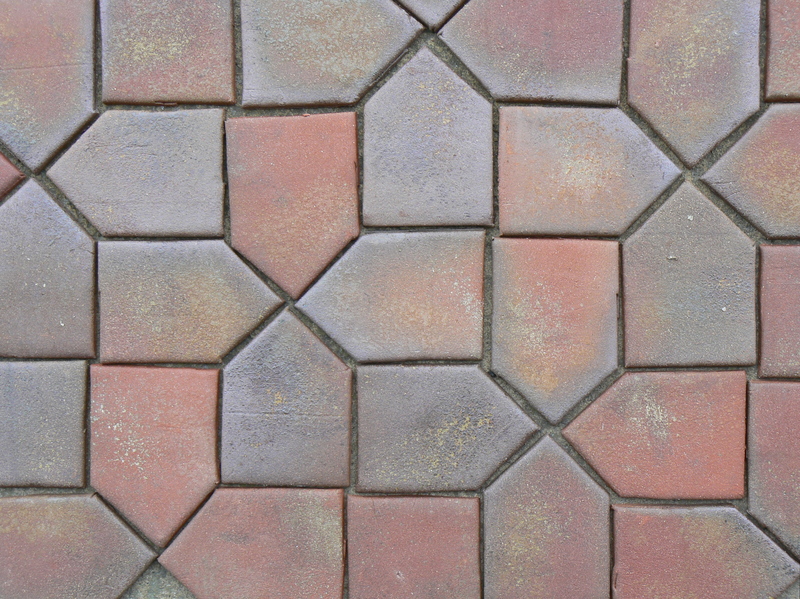 See our plain mosaic hexagons in the Old World collection. All of Provence tiles will be made to order—choose your stenciled patterns in white tones, black or darker red and personalize the design for your home. Watch for more Provence collection tile designs coming soon. Among the tiles in product development are some with floor designs created on 10.5” square tiles. 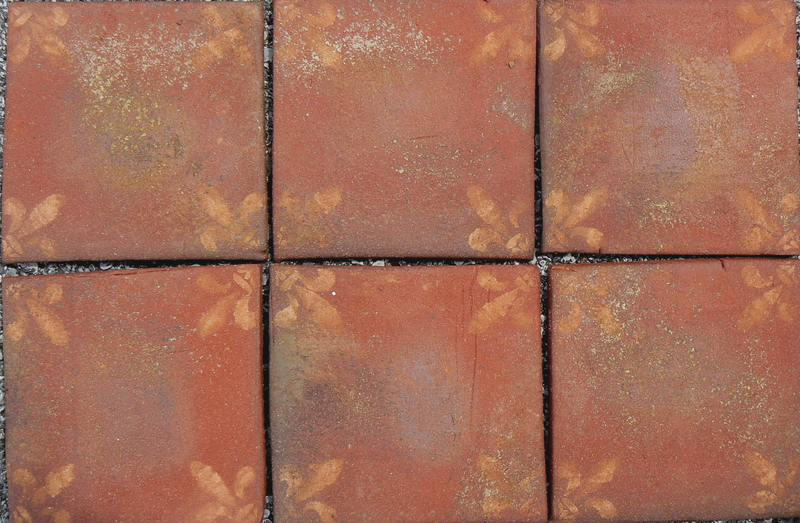 Provence collection tiles will be available for sale starting this fall. Call to pre-order samples and to receive more information. Soon, we will introduce our final new collection, the Castles and Abbeys collection, offering timeless interpretations of medieval tiles for your home. With the Old World collection, we at Inglenook Tile have reached back into history, uncovering designs used by ancient European cultures where tile making was considered an art form. As we leafed through historic resources, we found an abundance of inspiration for the modern home: the clean lines and quality craftsmanship of Nordic ceramics, the lacey patterns of Celtic motifs, the fanciful designs of antique German chocolate and butter molds, and the tile patterns used in ancient European courtyards and banquet halls. The Old World collection brings your home the best of Northern European design, rooted in history, yet timeless in essence. The first designs in our Old World collection were tiles historically known as “plain mosaics,” repeating patterns of tiles that fit together to form broad patterns across your floor. These flooring tiles, not to be confused with Roman mosaics which are composed of tiny cubes, were popular in many parts of the world in ancient times for their simplicity and beauty. Plain mosaics also experienced a revival during the Arts and Crafts movement, 1880-1910, and found a place in this period’s bungalow-style homes. To achieve an authentic aged appearance, we have painted our “plain mosaic” designs with thin clay slip or sprinkled them with oxides and clay powders, techniques similar to those used to achieve color variation in ancient times. Through the firing process, random color flashing produces beautiful variety of natural earth tones on the flooring. The first of our plain mosaic designs came out of the kiln yesterday morning. We were excited to see how they turned out and are now excited to share a couple of them with you! To start, we have pictured the “Ell” plain mosaic and “Diamond point” plain mosaic in this post. The Ell plain mosaic creates several historic flooring patterns. The first pattern, known as “herringbone” after the symmetrical angles of fish bones, creates long, elegant rows across the floor. 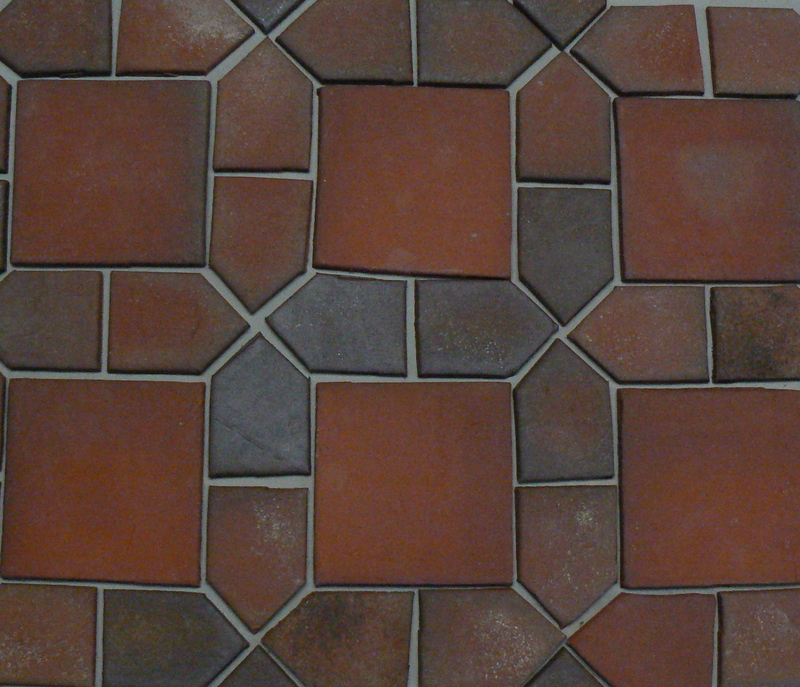 The Ell plain mosaic also pairs with 4×4” squares to create another historic flooring pattern. We stamped the pictured 4×4” tiles with woodland animals, but you can also use them in this pattern unadorned, relying on the natural color variation to create interest on your floor. 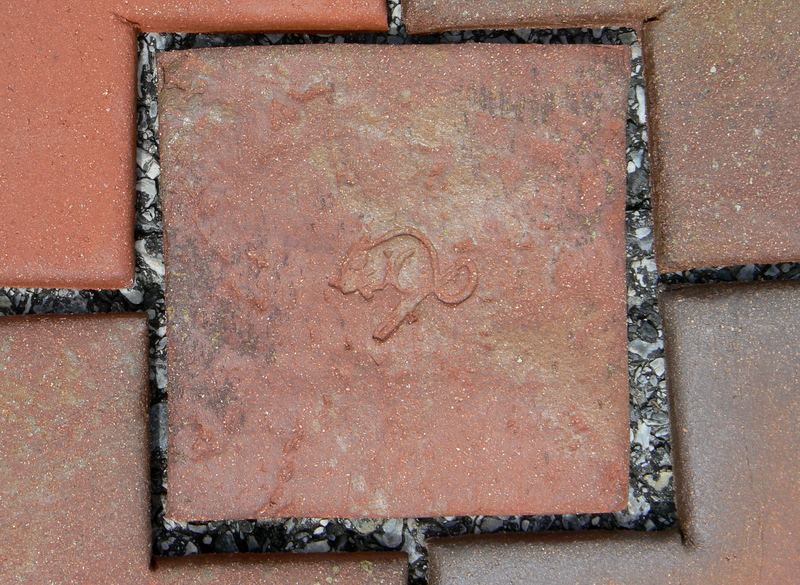 The close-up image pictures a mouse stamp on the 4×4″ tile. The Diamond point mosaic tile also has a variety of potential installation options for your floors. Finally, the Diamond point plain mosaic can also install as a hexagonal border around a square tile. 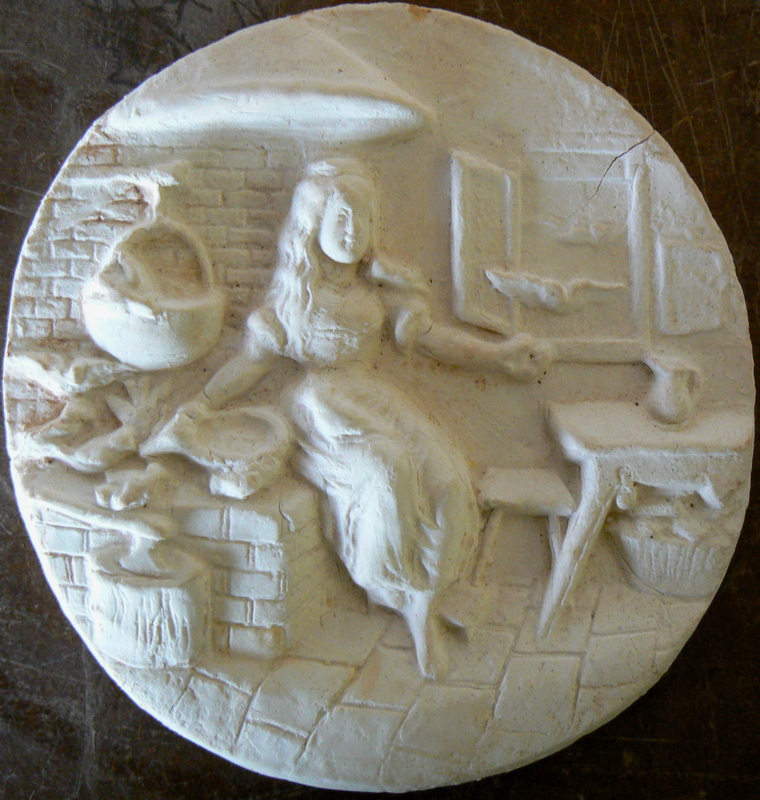 Shown here with a darker firing. Old World tiles will be available for sale starting this fall. Call to preorder samples and to receive more information. 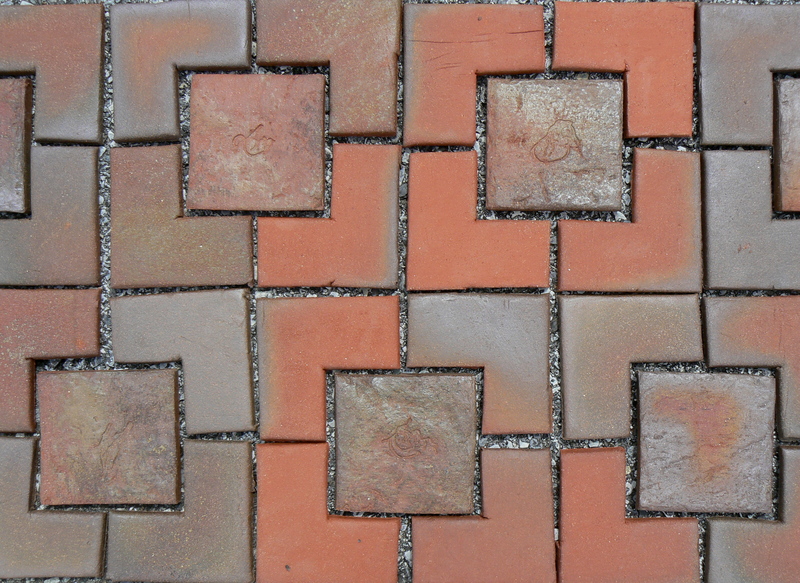 Watch for more Old World collection tiles, coming out of product development soon! Tomorrow, we introduce the Provence collection, our line featuring the tiles and motifs of historic Southern Europe. 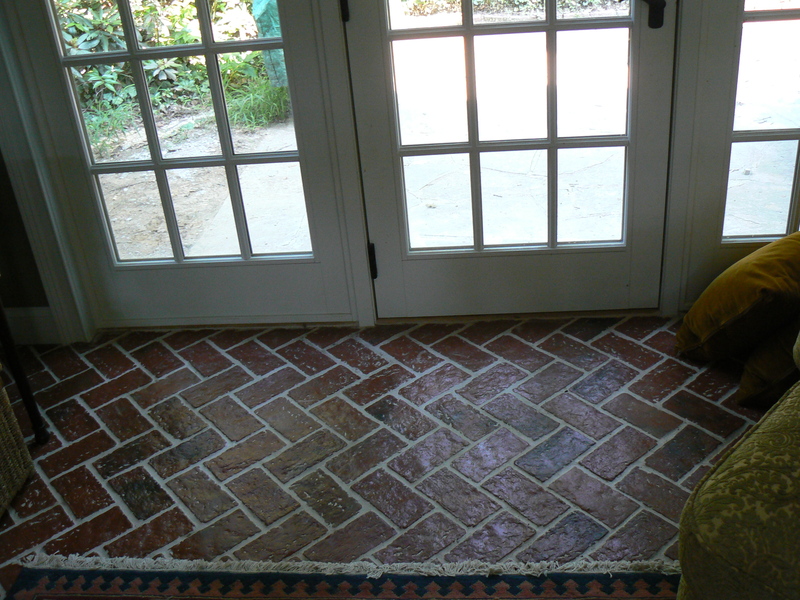 We often have potential customers wonder how to clean our brick flooring. “Just like any other unglazed tile or stone floor– vacuum and wipe up occasionally,” we reply cheerily. But what does that mean, exactly? How often do you vacuum or mop? And with what type of tools or cleaner? Is it easy or does it take a lot of time and work? Over the next several weeks we hope to answer these questions for you through providing instructions, tips, and product reviews about cleaning brick floors. This posting is the first of these entries. Many of our customers rave about how easy maintenance their brick tile floor is, especially as compared to its full brick counterpart. Walt, from our blog’s feature project, Harvest Moon Farms, is a recent fan. “It’s so easy to take care of,” he said, “We just vacuum it.” Another customer, Debbie, let us know that she how thrilled she was about the floor’s easy clean-up. When her elderly dog had accidents, she said, she always hoped it would be on the brick tile floor because it easily wiped up with no mess or residue. At home, we think our brick tile floors are easy care, too. We vacuum our front entry occasionally and are grateful that the floor does not show dirt well for the times in-between. For kitchen and bathroom floors, though, cleanliness is paramount. Luckily, brick tiles can be kept spick and span, regardless of in which room they are installed. For routine cleaning, vacuum or sweep your brick tiles, as you would any other uncarpeted floor. Vacuum weekly or as often as you clean the rest of your home. Floor or wall interior bricks may be dusted with vacuum cleaner dusting attachments. After vacuuming, you can wipe with a plain water and damp mop, if desired. This step can help prevent dirt from building up on your brick floor. 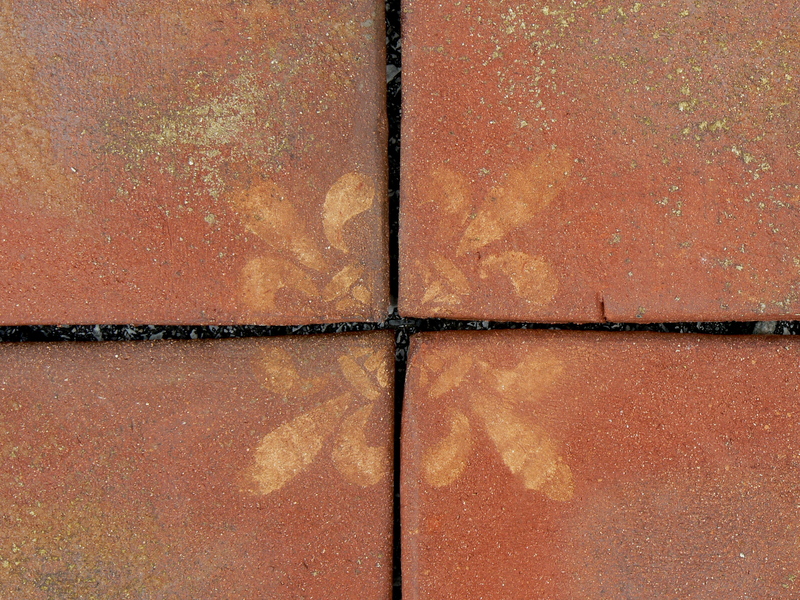 When more heavily soiled, the bricks may be cleaned using a mild detergent solution. Soap and water works fine, but you can also use commercially available detergents for tile or stone floors. Rinse them well, and wipe dry for greater sheen. To save time, try putting 1 cup of vinegar in the water; the floor will shine without being polished. Do not clean unglazed ceramic tiles with acids, strong soaps, or abrasives. We recommend using microfiber mops rather than sponge mops, since sponge mops often do not hold up well on the texture of unglazed floors. Several customers report that the robotic mopper, Scooba, works with great success on their brick tile floors, as well. 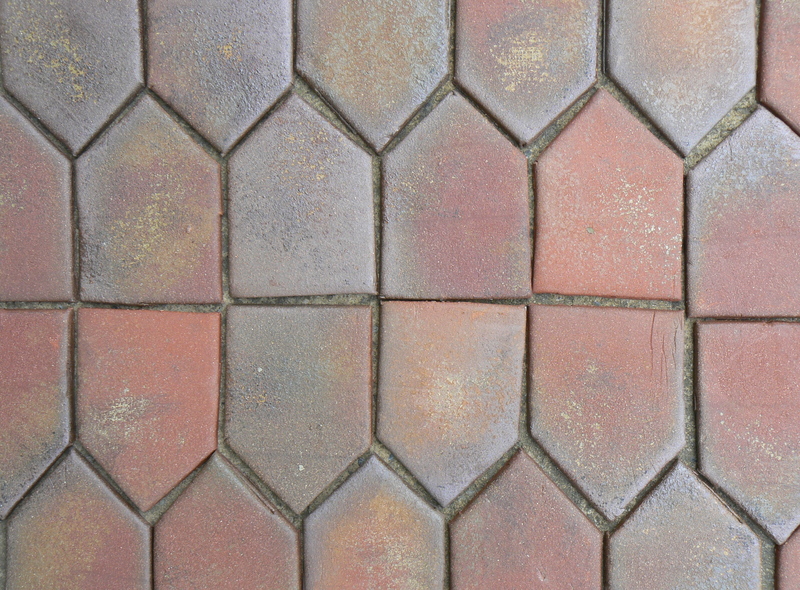 Remember: Always seal brick tiles or other unglazed ceramic or stone flooring prior to washing. Unsealed tiles, bricks, and stones are porous. We hope this information is helpful to you! We are going to be experimenting on our brick tiles in the upcoming weeks with different non-toxic cleaners, mops and other cleaning tools and reporting back to you on our success. At the end, I will compile all the reviews into one easy to use guide. Check our blog often or subscribe via RSS or via email to keep up with the news.